Stuart Somerville 1908 – 1983. A Painter of flowers, landscapes, figures and interiors. He studies with his father a landscapist Charles Somerville. 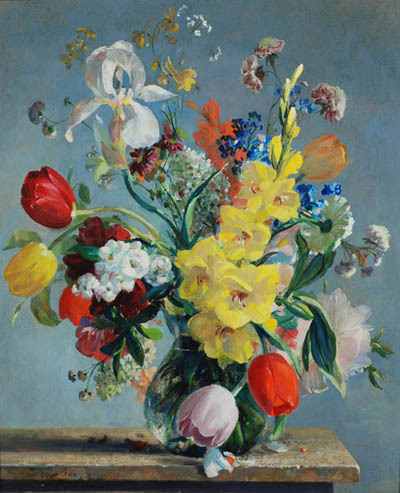 He exhibited at the Royal Academy from 1925 to 1961. Between 1934 and 1935 he traveled in East Africa recording the British Museum expedition. His work ranges from finished from finished flower paintings to brush drawings of great verve and economy. Some African watercolours use a rapid, calligraphic style reminiscent of oriental art and he often used vivid colour.